Many Ways to Use “I am” Poems! Several years ago, I observed a demonstration lesson at the Long Island Writing Project’s Summer Invitational Institute (ISI). The teacher used a formulaic poem, the “I am” poem, to have us first personalize an object in nature, such as a tree. Later, she read the book The Giving Tree by Shel Silverstein and assigned us roles- either the boy or the tree. We had to write the “I am” poem from our assigned perspective. Then, she paired us up so each group had a boy and a tree. We read our poem as a poem for two voices, with one person reading their first line and then the second person reading their first line directly after. This really emphasized the personality traits of each character and sounded so interesting read aloud! It was a brilliant lesson. I’ve shared that lesson with others through the years at the Long Island Writing Project and even at conferences. When I taught kindergarten, we created a shared version of the “I am” poem for the book Horton Hatches the Egg by Dr. Seuss, writing first from Horton’s perspective and then from Mazy, the bird’s. Last year in third grade, students used the “I am” poem to introduce themselves. High school teachers I know have used the “I am” poem as a poem for two voices with “Romeo and Juliet.” I even wrote an “I am” poem about being an expectant mom when I was pregnant with my son, Alex. 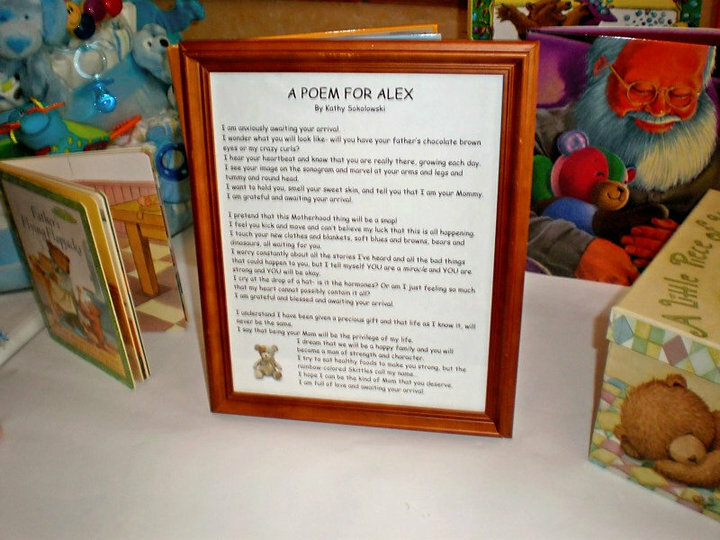 The poem was displayed at my baby shower and meant a great deal to me. Teacher/student “I am” poems: At the Long Island Writing Project, we sometimes pair up with the teens that are taking the summer Creative Writing Retreat during the ISI. The purpose would be to talk with each other and learn what school is like from the students’ point of view. One summer, we had teachers write an “I am” poem from the vantage point of a teacher and students wrote one from their perspective. We paired them up to read it as a poem for two voices. This revealed the challenges and hopes each person had and gave us some empathy for the other group. If you work with teachers as a coach, having teachers write an “I am” poem about who they are as a teacher is an interesting way to allow teachers to have a voice and start a conversation about the current realities teachers face. If you are a classroom teacher, asking your students to share what it’s like to be a student through this formulaic poem might offer more insights than a simple discussion or reflective paragraph. Beginning of the year /End of the year: Students can write an “I am” poem early in the year and then rewrite one at the end of the year, reflecting on ways they’ve stayed the same and ways their perspectives have changed over the course of the year. “I am” poem as a reading response: Once students know this structure, they can use this poem as a reading response idea and write from the perspective of any character in a book they are reading. They can also attempt a poem for two voices by writing one for conflicting characters, such as Ally and Shay in Fish in a Tree. Exploring an ideal: Each month, my school focuses on a character trait, such as acceptance, courage, and honesty. I’m planning on having students write an “I am” poem from the point of view of that ideal. What would Honesty hope for? Would Courage fear anything? What does Acceptance dream of? This might be a challenge for third graders but I think modeling it and trying one together first might help them be ready to give it a go. Being able to write a poem about these ideals would show a deeper understanding of these traits. Curricular connections: In science, students can write an “I am” poem for a multitude of topics and even create poems for two voices (predator and prey, vertebrates and invertebrates, etc.) Systems of the body, such as the skeletal system, could be personified through an “I am” poem, revealing what the student knows about this topic in a creative way. In social studies, there are also endless possibilities. Any historical figure’s perspective could be explored through the “I am” poem and poems for two voices could be written for opposing sides in wars, such as the North and the South in the Civil War. Slice of Life Story Challenge: Last March, I wrote a slice about being a working mom through the “I am” poem. Anyone writing a SOLSC can think about a role they are currently in- adoring aunt, mom to teens, mother-in-law to be, etc. and write from that point of view. What are some ways you have used an “I am” poem or envision yourself being able to use it? Share your ideas in the comments! 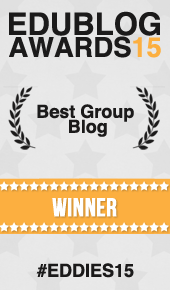 We are honored Two Writing Teachers was nominated as a finalist for the 2015 Edublogs Best Group Blogs (http://edublogawards.com/2015-finalists/#group). We are humbled to have been nominated with so many other outstanding education blogs. If you feel compelled to vote for us, please do so by Wednesday, December 16th at 11:59 p.m. EST. You may cast your vote for Two Writing Teachers at http://edublogawards.com/vote-here/. I am grateful and awaiting your arrival. I wonder what you will look like and if you will have your father’s shoe-button eyes or my crazy curls? I hear your heartbeat and know that you are really there, growing each day. I see your image on the sonogram and marvel at your arms and legs and tummy and round head. I want to hold you and tell you that I am your Mommy. I pretend that this Motherhood thing will be a snap! I feel you kick and move and can’t believe sometimes that this is all happening. I touch your new clothes and blankets, blues and browns, bears and dinosaurs, all waiting for you. I worry constantly about all the stories I’ve heard and all the bad things that could happen to you, but I tell myself you are a miracle and you are strong and you will be okay. I cry at the drop of a hat- is it the hormones? Or am I just feeling so much that my heart cannot contain it all? I understand that I’ve been given a precious gift and that life as I know it will never be the same. I say that being your Mom will be the privilege of my life. I dream that we will be a happy family and you will become a man of strength and character. I hope I can be the kind of Mom that you deserve. I love this idea. I teach about multiple perspectives all the time. This is a perfect way to get kids thinking about it. Thanks! Such great ideas. I have only used the I am poem in the traditional sense. I want to try out the one you suggested about Fish in a Tree. My goal is to finish it before the Christmas break. These are brilliant ideas to extend the poem! Several summers ago, while taking a course taught by Kate Kennedy, she has us create an I Am poem to ground us in the work we were to do during her course. I really like the idea of the teacher/student two voices. Oh, Kathleen! I love all the wonderful ways to extend ” I am” poems. I haven’t used them in years, however, reading through your blog, I now know there are more ways than one to use it as an extension for reading and writing.